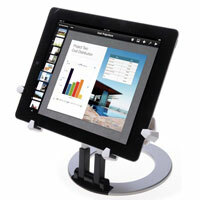 Do you need iPad desk stands that are stable, lightweight, and both easy to use and easy to move as needed? 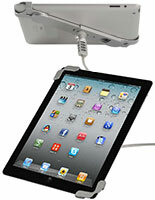 iPadHolders2go.com offers countertop displays for mounting handheld computers that meet every business and personal tablet need. 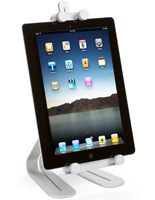 These non-locking tabletop iPad desk stands, also known as countertop handheld display mounts, allow devices to be used hands-free for more efficient use. 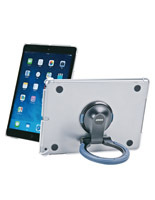 Reading, studying, checking email, watching movies, or just browsing web stores and news outlets are some of the many activities that are easier when using residential or commercial tablet mounts. 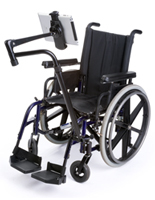 Many models feature extendable arms or goosenecks that can be configured in almost any position. These affordable non-locking Apple® iPad desk stands feature adjustable settings to facilitate comfort at work or in the home. In addition, many businesses use countertop displays for handheld devices to provide customers with information, present advertising and marketing messages, for product display or sampling, and for testing or using various applications. Whether an iPad desk stand is are used singly or in installations of multiple devices, it is a very useful business tools for a variety of industries, in addition to being excellent supports for home devices. There are even brackets designed specifically for use in the car for GPS purposes, or passenger entertainment. In addition, schools can use touchscreen device enclosures as learning stations, and many college students use them to study. These residential and business mounts for tabletop come in myriad styles, but are typically either folding or hinged in design. While some easels have fixed mounting mechanisms to hold tablets fixed to the display frames, others are designed to cradle the smart device without securing them so that they are easier to move to different locations. Easels generally offer great portability and a range of tilting options for optimal visibility. What styles in non-locking countertop touchscreen mounts are available here and what is the purpose of each? 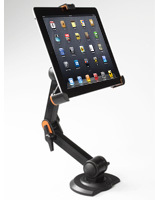 Fixed Mount iPad Desk Stands: Rather than adjusting like an easel, this type does not move. 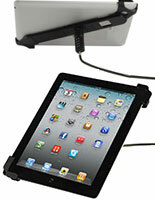 Generally, displays such as this feature a mounting bracket that attaches to the tablet for display. In most cases, it offers tilting options for adjusting the screen. These supports, depending on their weight and mounting system, are easy to transport. Clamp Mount Computer Enclosures: This type has either a fixed or flexible "neck" for modifying visibility. Clamp mounts are designed to be affixed to the edge of a desk, table, or other stationary object. Clamping configurations are a great solution when you need a portable display that will remain in fixed position until you move it. These accessories that are typically either folding or hinged in design include easels with mounting mechanisms that hold tablets to the display frames in fixed fashion, while others are designed to cradle the smart device without securing them for easy mobility. Easels generally offer great portability and a range of tilting options for optimal visibility. 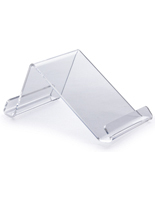 There are a lot of common features among the different styles of residential tabletop display stands, as well. Some are designed to work when the tablets are in their cases or covers, and some are not. For business use, many of these non-locking displays are designed to cover the "home" key to prevent unauthorized program access. 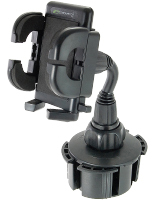 Some table top stands even offer space to accommodate accessories, while others are designed to mount to surfaces, such as a dashboard, headrest, or car windows. In addition, some residential or business desktop display stands are intended only for use with specific generations of Apple® products. 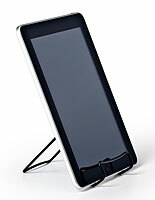 The specific non-locking tablet stands also differ: some styles are "cases" that cradle the entire device, while other models offer corner-mounts to hold tablets in place, and still others offer holders that are not fixed, but simply held snugly within the unit. Our detailed product descriptions for each of these non-locking stands for touchscreens explain if specific devices are required, and whether the display cases may be used with tablets other than those made by Apple®.